Very feminine, short maternity /feeding dress perfect for sunny days. The dress has fashionable cutouts on the shoulders. The female chin gives a frill to the neckline under which the feeding system is hidden. A delicate zipper allows easy feeding in a variety of situations. 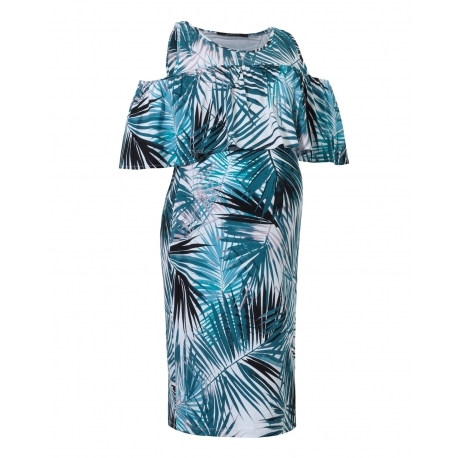 Weba pregnancy dress comes in three kolor options - a fashionable palm pattern, energetic raspberry and classic black and white stripes. Sandals, sneakers or wedges will perfectly match to your dress. Our style was made in 94% of delicate, breathable viscose and 6% of elastane responsible for the flexibility of the dress, which grows with the tummy. Washing instructions - machine wash at 30 degrees in a delicate cycle, do not spin, do not dry clean, do not use bleach. Dry in a horizontal position.